Now Freni wants innkeeper Magdalena Yoder to find the little one. Magdalena decides to humor her eccentric cook and start searching, but while questioning doctors and nurses, the strangest thing happens: Their stories don't add up. And the only one who seems to be making sense - is Freni. Magdalena better find answers quick before the cradle robber strikes again...."
What a hillarious book! I''m on the look-out for more in this series. This is the second one I''ve read and they have both been so funny. I highly recommend this one. Released to affinity4books virtual mystery bookbox and released for week #31 of the Never Judge a Book By Its Cover release challenge. Oct.23/07 This was not chosen from the bookbox, and was now released at the Burnaby meet-up. Enjoy! Picked up at the Burnaby-New Westminster BookCrossing Meetup. 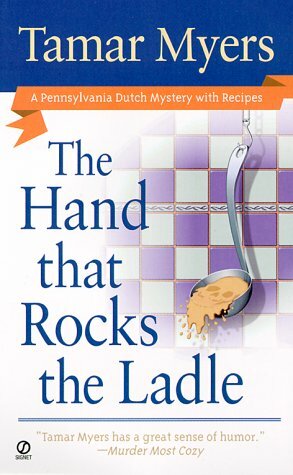 Yes, another very funny mystery from Tamar Myers ---good sounding recipes too.